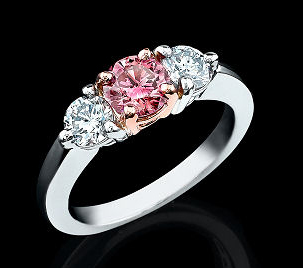 Takara lab grown Pink Diamond Ring Loose Takara Pink Diamond in Sunlight The Beauty of Colored Diamonds in One Ring! Above: An assortment of lab grown Takara pink diamonds. Real pink diamonds, but grown in a lab instead of under the Earth. Pink diamonds are world-reknown for their exceptional beauty. With an attractive and rare feminine color, pink diamonds encompass both the beauty and fire of diamond but with a uniquely feminine aspect. In this guide, we'll provide the background and basics of pink diamonds, explore what makes them pink (vs the more common white diamonds) and then delve into the options for how you can obtain and own one of these uniquely beautiful pink diamonds grown in an ethical, environmentally sound manner. Pink diamonds are completely unique in that they have no impurities to cause their color! Most diamonds that have color (blue, yellow, etc) have their color due to impurities. 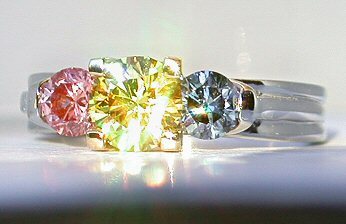 Above: An extremely rare tri-color Takara lab diamond ring - Fancy Vivid Pink Diamond, Fancy Vivid Yellow Diamond and Fancy Vivid Blue Diamond (all lab grown Takaras)! Yellow diamonds are yellow from having additional nitrogen included during growth. Nitrogen has an extra electron compared to carbon (5 vs 4), and this electron absorbs some of the blue light, leaving excess red and green coming out which blends to form yellow. Blue diamonds are blue due to boron being included during growth. Boron only has three electrons, and the missing electron slot absorbs some of the red wavelengths, turning the diamond blue in appearance. Pinks were originally tested searching for an impurity to explain what makes them pink, but none could ever be found. This created a long time mystery in the diamond world as to what caused the obvious pink color. After extensive research it has been determined that the pink color comes from being grown in, or exposed to, exceptionally high pressure - well above that of what is present for white diamonds to grow. At the atomic level, this creates alternating bands of compressed structure alternating with regular white (clear) diamond bands. This is termed "twin planes". It is the compressed bands interacting against the white planes that produce a unique structure that distinctly produce the actual pink color. The pink is created because the structure at the junction between the twin planes absorb some of green from incoming white light, and thus create the attractive pink color of a true pink diamond. The super high pressure required to form this alternating structure to make a pink diamond can come from seismic shock (i.e. sudden fault shifts or earthquakes) or volcanic explosions or similar, but the root cause of a pink diamonds 'pinkness' is the super high pressure shock it is formed under or exposed to. While all mined diamonds are formed under high pressure, pink diamonds are formed or exposed to a whole different level of super pressure. The compressed layers are up to 10x that present in a white diamond, indicative of exposure to massive amounts of pressure relative to ordinary white diamonds. 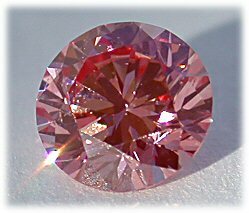 For lab grown pink diamonds, these are created by first growing a diamond via usual practice (HPHPT or CVD), and then a second step of running the diamond in secondary round of high pressure/high temperature to create the necessary pressure to turn create the unique structure that turns it pink. This requirement for a diamond to be exposed to super high pressure may be part of the reason that pink diamonds are so rare. It requires an exceptional event like a volcanic explosion to create the conditions necessary to produce a pink diamond, versus the conditions for white diamonds are much more common. How rare are Pink Diamonds? Pink diamonds are among the rarest of diamonds. For every million carats of white diamond, there is roughly 1 carat of colored diamonds. And within that 1 carat, only 1% of that would be pink diamond. to the world record ever paid per carat - $2,100,000 per carat! This was for a 5 carat, Fancy Vivid Pink Diamond known as the The Vivid Pink. It was sold at auction for a total price of $10.78 Million. 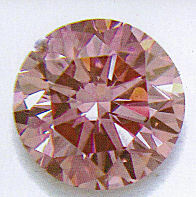 Pink diamonds are graded and valued based on the intensity of the pink color, along with any secondary 'overtones' (purple, orange and brown are most common). Fancy Intense and Fancy Vivid are the most valuable colors, as the pink is easily viewable and immediately recognized as a Pink Diamond. Some of the Faint Pink Diamonds, or similar lower pink intensity grades, are effectively clear white diamonds with a hint of pink when placed against a white background by comparison. As noted, following the Pink Intensity, any secondary hues are noted - thus you might see "Fancy Vivid Purplish Pink" meaning it's a pink with touch of purple mixed in. This is quite a striking combo that produces a richer pink color. Orange and Brown secondary hues are considered negative hues as it reduces the pink beauty, and thus diamonds with these hues will not be priced as high or considered as valuable/beautiful. The pricing can be 5x higher for a Purplish pink diamond compared to an Orangey Pink diamond! What about clarity grading for Pink Diamonds? While clarity can make a large difference in white diamonds, with a VVS clarity commanding much higher pricing than an SI clarity diamond, the situation is very different for colored diamonds. For colored diamonds - color is virtually everything! A vivid will command more than an Intense, which will be higher than a Fancy, etc. Clarity basically rarely affects the total pricing for a colored diamond including pinks. The 4 C's are - Color, Color, Color, Carat (joking but a lot of truth in it). Clarity inclusions simply are not as easily seen in a colored diamond versus being more visible in a white/clear diamond, so that is part of the reason for the difference in terms of how clarity affects diamond pricing in the respective worlds of white diamonds versus pink diamonds. But the main reason that drives Pink Diamonds price or value, is from their Pink color, and the intensity of the pink color. Incidentally, most of the worlds Red diamonds for example, are SI clarity grade. Yet command massive pricing due to their red color. Lab Grown Pink Diamonds - are these real diamonds? Extremely high quality, real diamonds are now being grown in various labs around the world. True Pink lab grown diamonds are rare as it's hard to do Pinks even in the lab, but our Takara lab grown Pink diamonds are the real deal - real, 100% Pink Diamonds. These will test positive as diamond in *any* diamond test - because they are 100% real pink diamonds, simply grown above the Earth's surface instead of below the Earth's surface. 2)replicating the extremely low pressure of outer space in a lab (there a lot of diamonds in outer space btw!) - this is known as CVD. Most lab grown diamonds are white or yellow or blue. 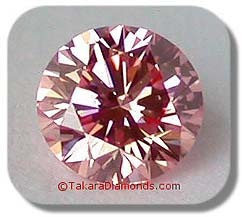 Our Takara lab grown pink diamonds are rare even in the lab grown diamond world, and are 100% real diamond. 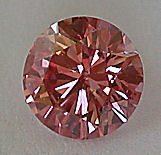 Takara pink diamonds can be grown using both of the above processes, as both produce real diamond. Our Takara pink lab diamonds are graded at independent diamond grading labs like any other mined diamond. The difference is they were formed in a lab rather than under the Earth's surface. Their pink color is naturally part of the diamond itself, and comes from the secondary step of exposing it to additional high pressure. These are not 'coated' pink diamonds, the color is atomically part of each Takara diamond itself. Where can I buy a real lab grown Pink Diamond? 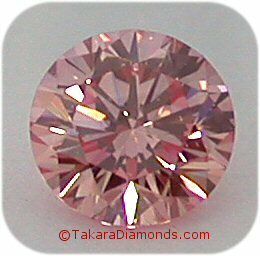 As noted, true lab grown pink diamonds are hard to come by but we specialize in Pink Diamonds and have a number of our Takara Pink Diamonds (lab grown) in stock in our inventory page here - Takara Pink Diamond Inventory page.